Good health brings the greatest happiness of all, and a child’s good health comes through proper feeding. That is why oatmeal is so preferred by mothers. No other cereal has so much solid nourishment. But there is a great difference in rolled oats. 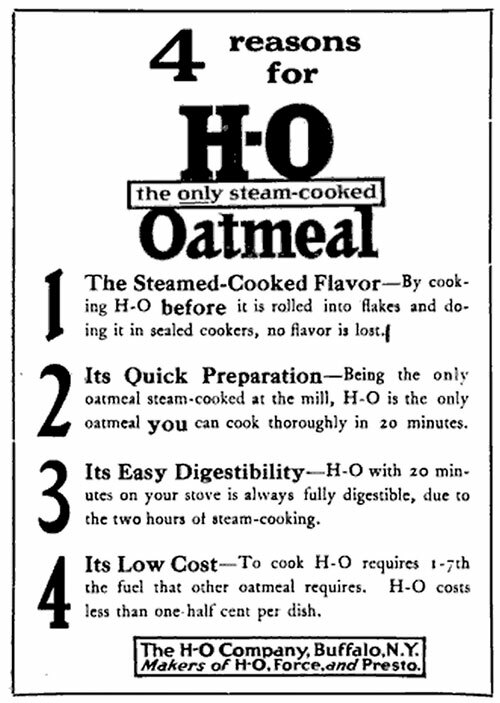 The superiority of H-O (Hornby’s Oats) is due to an exclusive process of Steam-Cooking and Pan-Toasting the oats in the old-fashioned way. The thorough Steam-Cooking in closed kettles, breaks down the starch cells to dextrinize the starch and make the oats digestible. Pan-Toasting in ovens over live coal fires, produces that delicious H-O flavor.